Vietnam rejoices and hopes as GM Nguyen Ngoc Truong Son takes a one point lead over his rivals with 7/8 in the Open U-18. On 6/8, are is his compatriot GM Le Quang Liem who after a bad first round is now in joint second together with IM Ivan Saric of Croatia and IM Jacek Tomczak of Poland. 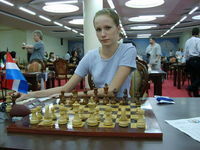 And in the Girls U-18, WGM Valentina Golubenko of Croatia, now on 7.5/8, has further extended her lead by an amazing 1.5 points. It is very much the same story in the Open U-16 with IM B Adhiban of India also extending the margin of his lead to 1 point with 7/8. This is also the case in the Girls U-16 with WFM Nazi Paikidze of Georgia now also on 7/8. India is dominating the U-14 category with FM Vidit Santosh Gujrathi of India still leading the Open U-14 with 7/8 and in the Girls U-14, IM Padini Rout on 7.5/8 has a 1 point lead. In the Open U-12, long time leader Darwin Yang of the USA on 7/8 points has been joined India’s Sayantan Das, and in the Girls U-12 tehre has been a reshuffle with WFM Rueda Paula Andrea Rodriguez of Colombia, Bodda Pratyusha of India, and Fliiz Osmandja of Germany all sharing the lead with 6.5 points each. Jan-Krzystof Duda of Poland has siezed a narrow lead in the Open U-10 with 7/8 while in the Girls U-10 Alekxandra Goryachkina of Russia and WFM Cecelie Haussernot of France all share the lead, also with 7/8. Finally, in the Open U-8, Vietnam’s Tran Minh Thang leads with 7/8 and in the Girls U-8, Zhansaya Abdulmalik of Kazakhstan and Gunay Mammadzada of Azerbeijan are now the front runners with 7 points each.